Here is my article in the Banking Review magazine. It's about current state and future trends of mobile banking for business. The main focus is on UX of banking applications. Here we discuss some new features such as document recognition via phone camera, fingerprint authentication, account managing through messenger. Other topics are new banking services available on mobile platforms, such as payroll, accounting, etc. This post is a little diversion from the main course of this project. Earlier I’ve been working on another UX research project which goal was to discover behavioral patterns in users’ sessions, in order to improve information architecture of the website. My approach was to apply hierarchical clustering to a number of sessions. But it’s hard to find any patterns when you parametrize session via URLs of each page in this session. Simply, it’s too much of diversity. For example, “catalog level 4 product list”, “catalog level 5 product page”, “news level 2”, etc. Performing some magic on distance measure and using Ward's minimum variance method while clustering, it gives very interesting outcomes for the information architecture analysis. But let’s get back to our project! I’ve mentioned Pagetype dimension because it helped here in this product list project too. Website I’ve been working on has product lists on different levels of catalog, from 2 to 5. 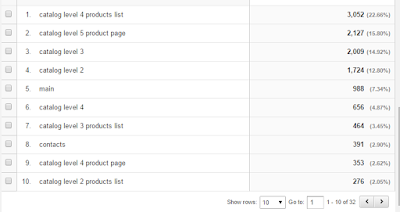 So I used Pagetype custom dimension to filter product list pages from pages of other types. I recommend to have such custom dimension if you work with behavioral patterns. Client => Session => Pageview =>Hit (Event). Due to already assigned Client ID and Session ID, we can distinguish one entity of that level from another. On the one hand, we have page URL. On the other hand, user’s trajectory over the website may be as complex as an analyst couldn't even imagine, including simultaneously opening lots of pages in browser tabs, switching back and forth between different windows (which affects visibility status), multiple hits on Back and Forward buttons, etc. That’s why we need Pageview ID to which we can assign all these events and gather them later in reports under one Pageview entity. 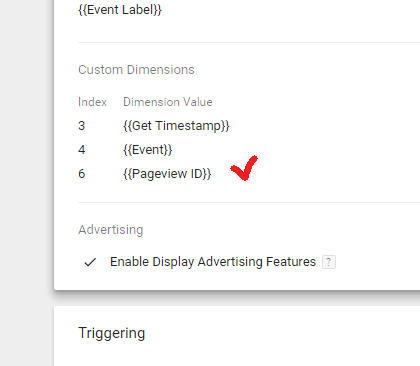 Make Custom Dimension “Pageview ID” in Google Analytics and remember its index. (See the picture) Under every Pageview and Event Tag, connect the Custom Dimension (recall its index) and the value of Custom Variable “Pageview ID” (like you probably did for Hit timestamp previously). So that must be it. Now each event falls into the right Pageview set (entity), with other events happened during the same pageview. First of all, there is a common approach to manage Google Analytics implementation - through Google Tag Manager. This method has many advantages, but discussion of those is beyond the scope of this series of posts. From now on I assume this approach by default. There is a great article of Simo Ahava “Improve Data Collection With Four Custom Dimensions”. It’s about 4 parameters which aren’t among dimensions and metrics of Google Analytics API by default, but are crucial for many web-analytics tasks. I didn’t use User ID in this project, but Client ID, Session ID and Hit timestamp were very helpful. For those of you who decided to implement these custom dimensions too, I want to warn you about the subtle mistake in the Hit timestamp setting. I’ve written detailed comment about this under Simo’s article. The next series of blog posts is dedicated to the UX research project I’ve accomplished recently. The described approach could be useful for e-commerce websites and online stores, especially those with large product catalog. Products in the catalog subcategories get unequal shares of user attention. Those in the top of the list are seen by almost all users. Bottom of the list gets multiple times less attention (twice as a minimum). Most users don’t scroll all the list throughout. But as statistics tells us, often the products from the top of the list don’t attract users’ interest. They don’t click on these products, they don’t put them to the shopping cart. At the same time, bottom list products get much more interest. So the main idea is to analyze ratio of each product’s visibility (attention) and users interest, and put most popular items to the top of the list in order to sell more. First, we make some tunings in our Google Analytics data collection process. We should track the page scroll to measure each product’s visibility. 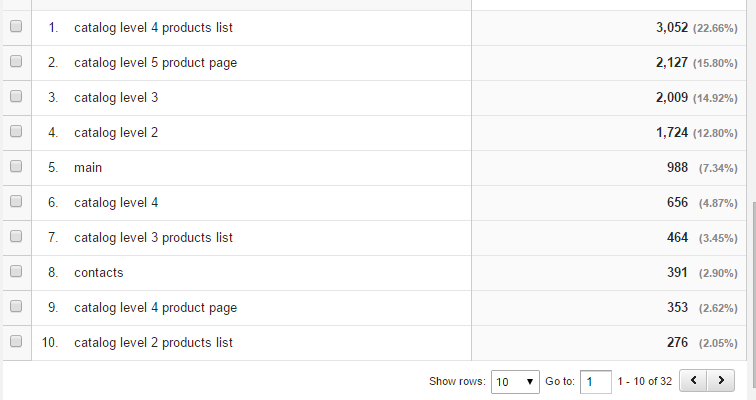 Also we need to gather information about clicks on the links to the product’s page and ‘Buy’ buttons for each product. Second, we connect to the Google Analytics API from statistical environment (Rstudio in our case), retrieve necessary information, make some exploratory data analysis and get the final report. This report gives us directions as to what permutations should be done in subcategories of our product catalog. So next time, we will start off with GA tuning. Learning Python for Data Analysis and Visualization course finished! It finally happened! Over 100 lectures course Learning Python for Data Analysis and Visualization on Udemy. Very good introduction to Data Science with Python language. Lots of useful outbound links for the further exploration. And lots of stuff to think about, like in which tasks one should choose Python and where to choose R.
Understanding the way users scroll pages on your site is important to measure the engagement. Being ensembled with metrics like “time on page”, it will get you valuable information about people’s interest in your content. I know, I know.. If you google something like “scroll depth tracking”, you’ll get ready-for-use Google Analytics plugin, which is apparently quite good. But what if you don’t want to involve jQuery or you wish to tune every subtle detail, or you have another reason to reject ready-made solution? Also I don’t really like the idea of sending some scroll stats (e.g. “50% achieved”) to GA before user finished working with the page.